Pretty candles are where it’s at these days, seriously, they are everywhere. And I’m not complaining – there are so many to choose from, with some absolutely beautiful scents and so many come in the dreamiest packaging. Of course that means it would be such a waste to throw candle jars away, especially if you’ve spent so much on the candle – instead, they can easily be upcycled and reusued, so I thought I’d write up a post on how I like to do this. When I get to the bottom of a candle I trim any remaining wick (if there is any) and dispose of it. Then I like to wait for the rest of the wax to cool slightly so that the jar is cool enough to handle. Once the wax is soft but not molten, take the jar to a sink and run it under hot water (not boiling as this can crack the glass). If there is a pretty label on your jar that you want to keep, be sure to wash out the wax from the side that doesn’t have the label – you don’t want to ruin it with water! Allow the wax to melt away from the glass and wash out of the jar. With the remaining wax that is stuck, gently pry at it with the back of a spoon and scoop this out, being careful not to scratch the glass. Then continue to run the hot water over the metal wick holder until the glue softens. Once this happens, you should be able to use a screwdriver to lift it off the bottom of the jar. Dry the inside of the candle jar with a clean tea towel and you’re good to go! Of course candles come in all different shapes and sizes and the size of the container depends on what you can use it for. 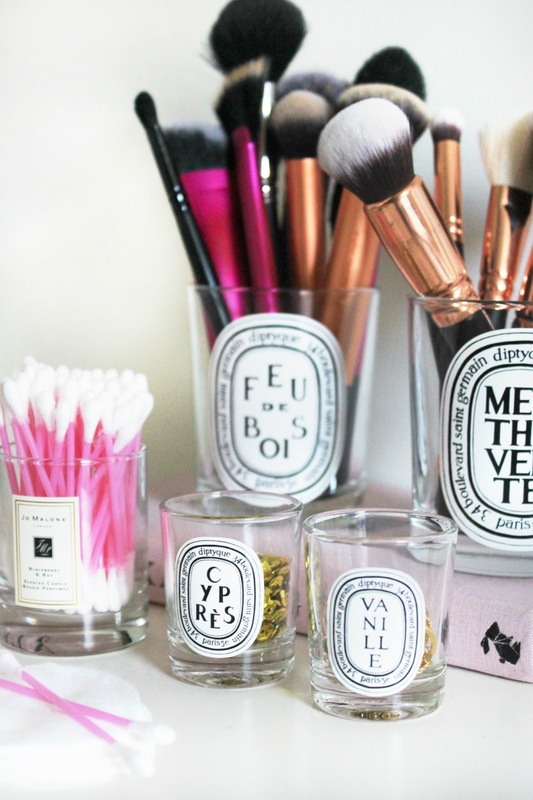 For larger candle jars, like the Diptyque 190g candles, I like to store makeup brushes or eyeliners/lipliners. You can also use them as a pretty pen pot on your desk or as a mini vase for some pretty flower heads. Peonies or roses would look beautiful in these on a desk – just make sure you cut their stems to the right length otherwise they’ll be too long. 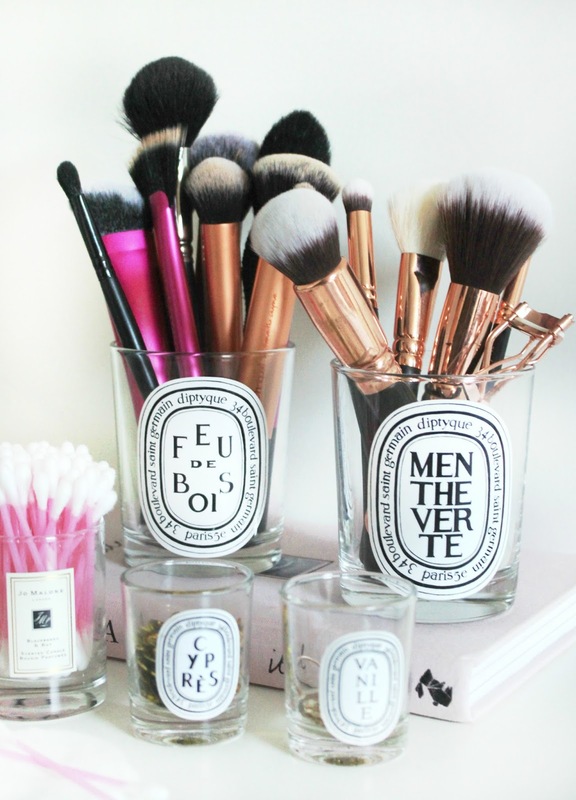 For smaller jars, I like to empty them and use them to store cotton buds on the bathroom shelf. Some smaller jars are large enough to fill with a stack of cotton pads as well which looks lovely next to one with cotton buds. They can also be used for desk snacks, such as trail mix. I find that they contain the perfect portion size for when I’m working away at my desk and fancy something quick to eat whilst I work! There are also super mini jars that some brands sell (again, Diptyque do 35g candles in certain gift sets and collections). I love using these to store small trinkets such as bobby pins, paperclips and even everyday jewellery pieces. They look adorable lined up next to each other on a desk or dresser – and they’re perfect ‘filler’ props for blog photos too (always a bonus!). What do you like using empty candle jars for?